Note: This column is not the main part of Pocket Perspectives. It’s up in the headline area under “Seeding the Clouds.” I put these “pages” and “Charging Well Being” checklists into this headline section, to show to Emily Esfahani Smith, the author of a terrific new book that I’m reading, The Power of Meaning, Creating a Life That Matters…and to show anyone else who might be interested… there are lots of good and helpful ideas below! it’s up to me to actually…. 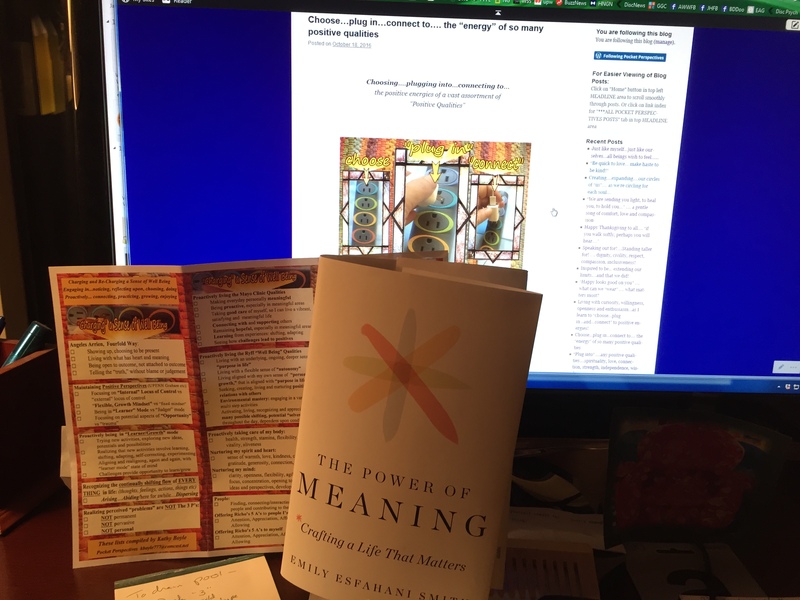 A photo of the book, The Power of Meaning, Crafting a Life That Matters, in front of a post on Pocket Perspectives… the ideas in that book are really helping me clarify and deepen the ideas I’ve been exploring and using. 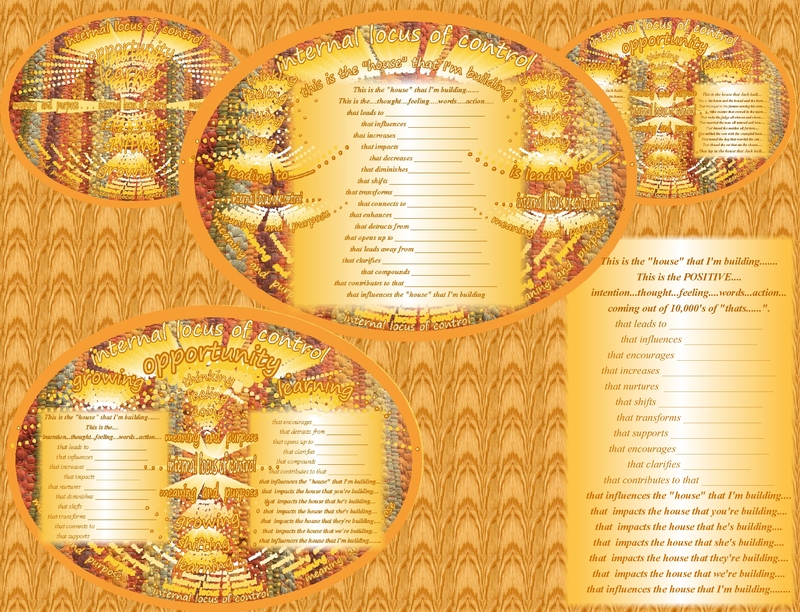 Some “pages” I’ve been creating and using over the past year…. 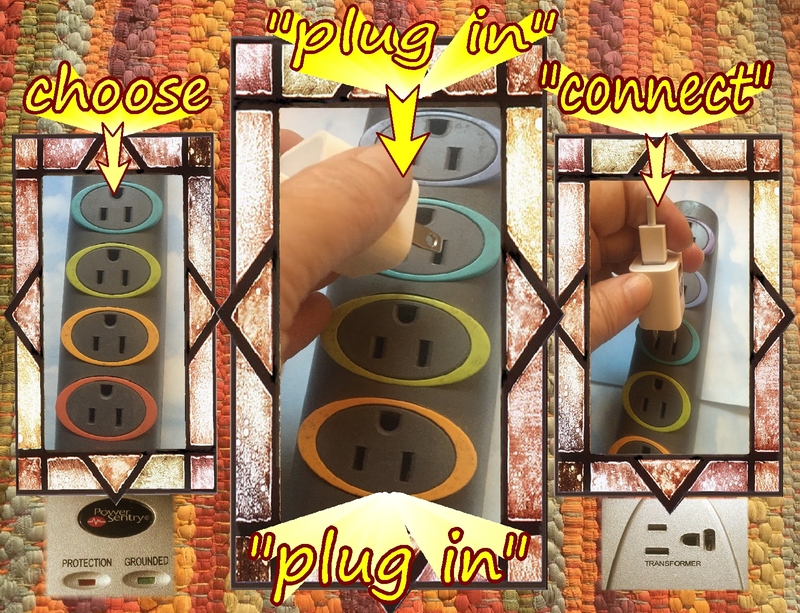 Earlier ideas, related to the Charging Well Being checklist ideas, posted October 2016, : Link to: Living with curiosity, willingness, openness and enthusiasm…as I learn to “choose…plug in…and…connect” to positive energies! 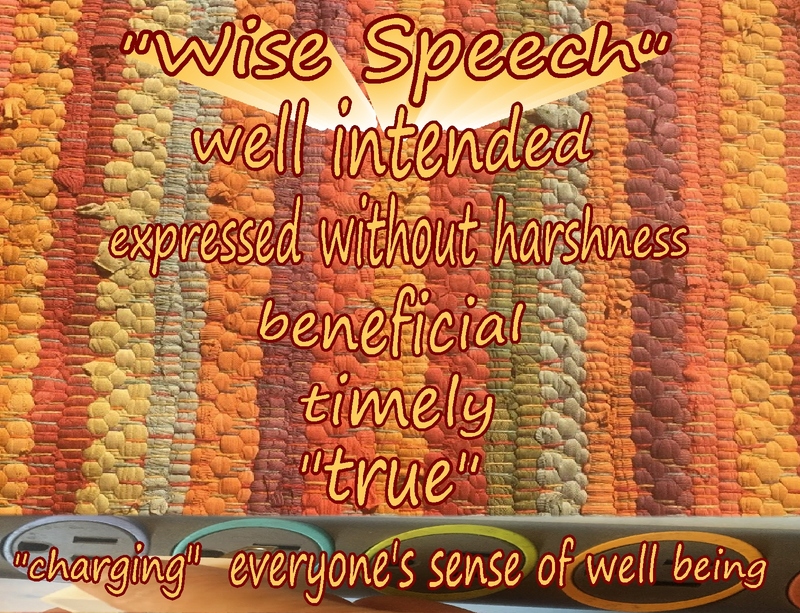 Carol Ryff’s Well being Qualities and Scale. (note: the photo in this link of me riding a motorcycle/dirt bike… I’m 68 years old, so that’s unbelievable, to me, that I did that!…actually “outrageous!”) Link to: Inspired to be… extending our limits….and that we did! ………. I actually did it! …………. 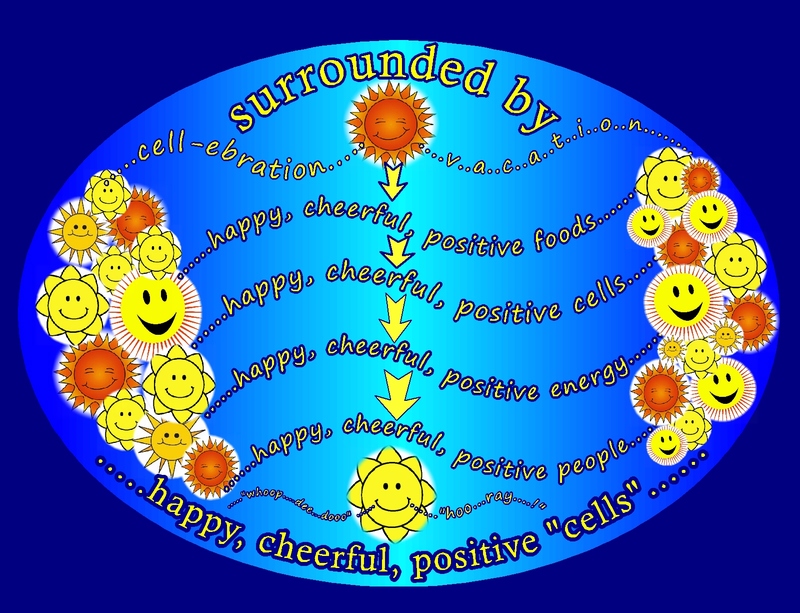 using ideas from various sources, for supporting living with a greater sense of “well being…. ideas from various researchers, authors etc…. REALLY HELPFUL ideas on the checklist! I waited and waited. I tried to live my life in a positive manner, but I didn’t seem to be able to reconnect with that steady sense of “well being.” I was pretty sure I wasn’t “depressed,” but I still felt “flat.” I couldn’t think of strategies to help myself “recover” and I didn’t really understand what I might possibly be able to do to support that. I DID know, however, that I DIDN’T want to stay flat or feeling like my life was continuing to feel disrupted! In February, I realized that I was going to have to take finding solutions to this challenge “into my own hands.” I decided that I would simply have to get activated and read, study, go to workshops and figure out what “resilience” and “well being” might entail and find simple, usable strategies that I could actually “use” and “live” to get myself back into a more dynamic frame of mind. I started reading and studying academic research, books and online articles about factors that are known to contribute to a steady, positive sense of “resilience” and “well being.” A lot is written about those topics and much is known! Unfortunately, the many wonderful, usable “well being” ideas are embedded in long books, academic studies and articles. When feeling “overwhelmed” or in the midst of a seeming “life quake,” it didn’t seem realistic to be able to search and sleuth for ideas…but I did. I read, highlighted, took notes and pulled out the ideas that I thought might be most “usable” and useful. 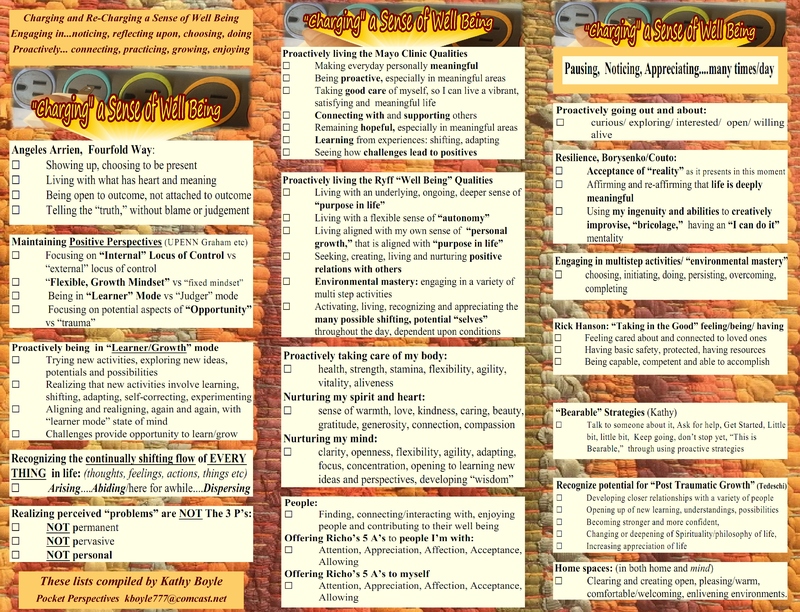 I selected the “well being” ideas and strategies that seemed like the most realistically useful and usable and organized those onto concise “checklists” that I could refer to throughout each day. And that I did! 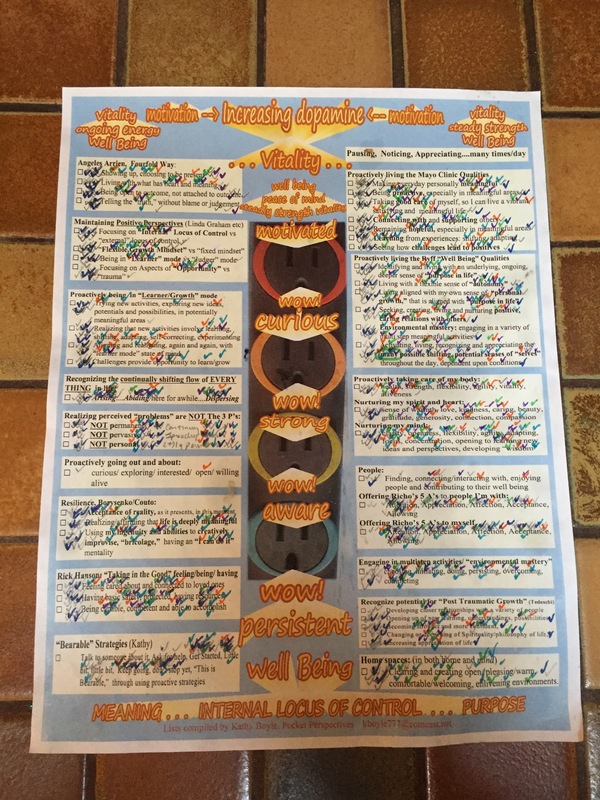 I’ve used the strategies and ideas in these checklists for the past 9 months…and they work! They help! I referred to, and continue to refer to, the strategies and ideas several times a day. I even taped copies of the checklists to the dashboard of my car, the kitchen cupboard doors and above the bed, to remind and reassure myself that I could learn and practice these ideas and strategies that contribute to a sense of “well being.” Later in each day, I reflected about how I was naturally using some of the strategies and figured out ways I could use more of them. 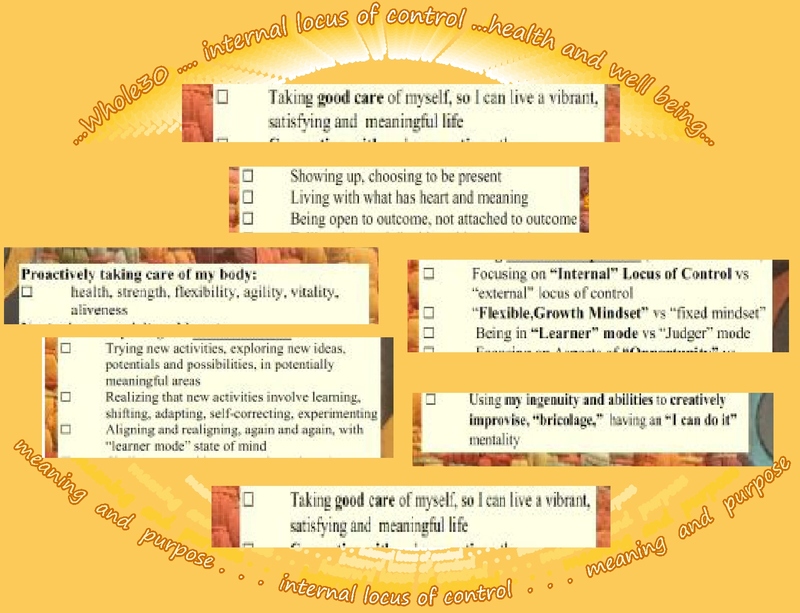 By recognizing, understanding, practicing and living these positive qualities and strategies day after day throughout the past many months, I seem to be creating and “living” with an increasingly steady and stable sense of “well being.” …still a work in progress…but they work! And so, as many of us might feel impacted by our own sense of “life quake,” perhaps due to personal factors, relationship challenges, health challenges or reactions to current affairs in the United States…I offer you the strategies, ideas, practices and encouragement on these checklists. They help! I encourage you to give them a try. Perhaps start with just a few and then expand to more. They work! 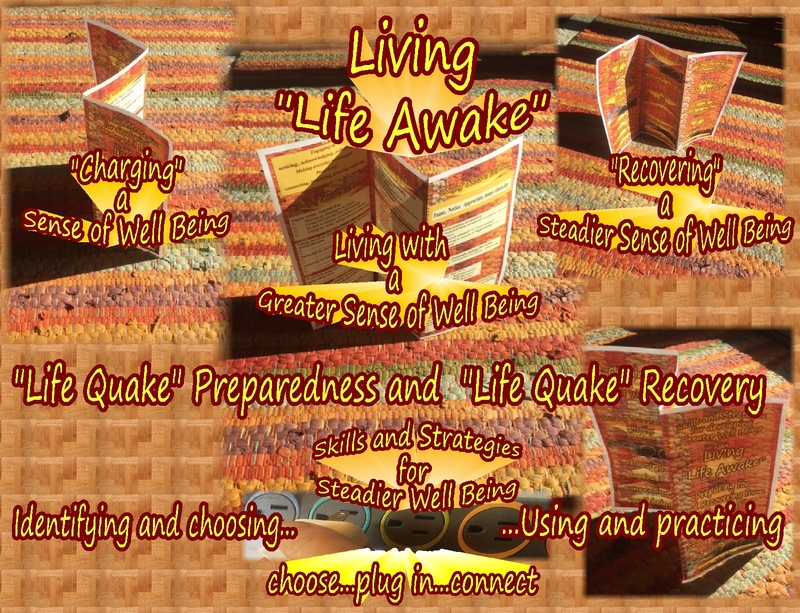 The sooner we can recover from the sense of flailing in the midst of a “life quake,” the sooner we can get back to living our lives in a dynamic, caring, proactive, engaged manner! Give it a try! 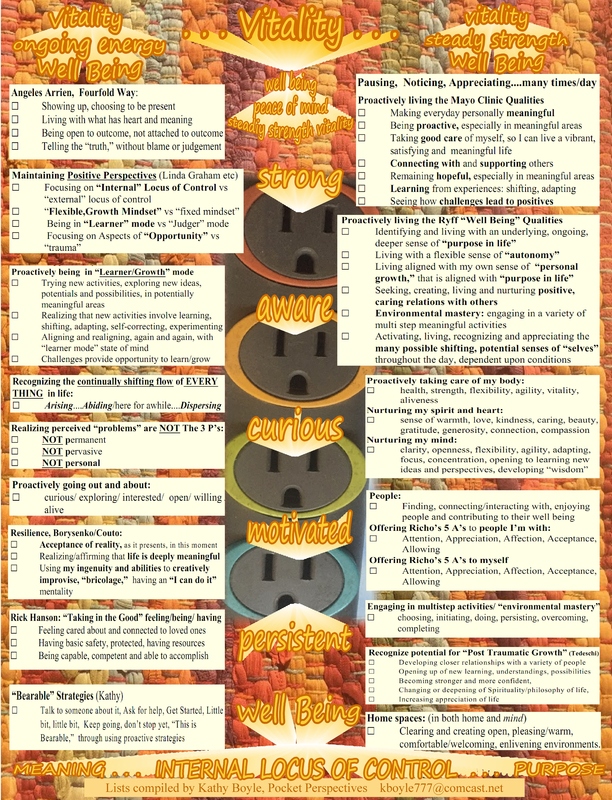 Here’s the actual “Charging a Sense of Well Being” checklist below, that I put together, use and review throughout each day…using it to align, again and again and again, with positive motivations, inspirations and aspirations…very practical and usable ideas, but within a much deeper, broader context of a sense of purpose and meaning…. And how wonderful to become more consciously aware of the specifics! This is the “house” that I’m building……. 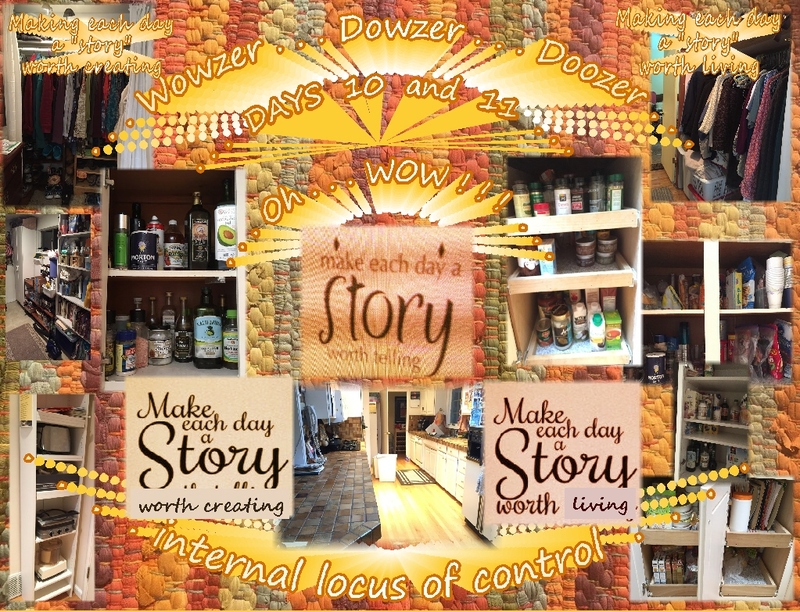 Seeing that actually living the ideas on the checklist, throughout each day, involves an “internal locus of control”…it’s up to me to make these choices…that’s good news! 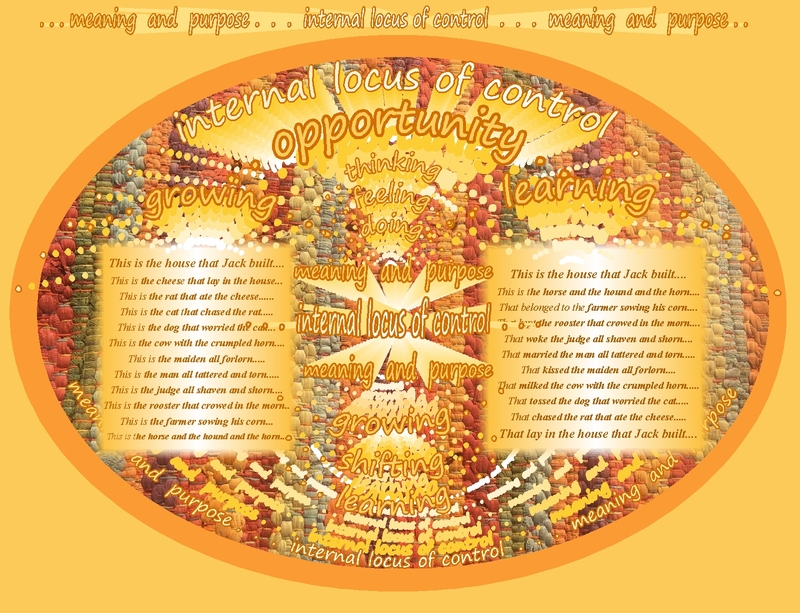 All coming out of my own identified sense of “meaning and purpose”…. 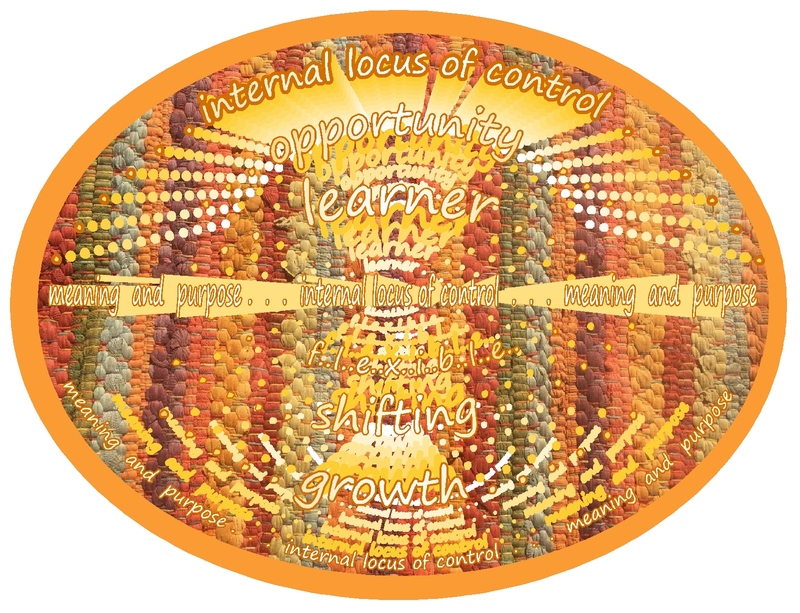 “Inner locus of control”….Good news! in myself and those around me…. that influences the “house” that I’m building…. that impacts the house that you’re building…. that impacts the house that he’s building…. that impacts the house that she’s building…. that impacts the house that they’re building…. that impacts the house that we’re building…. 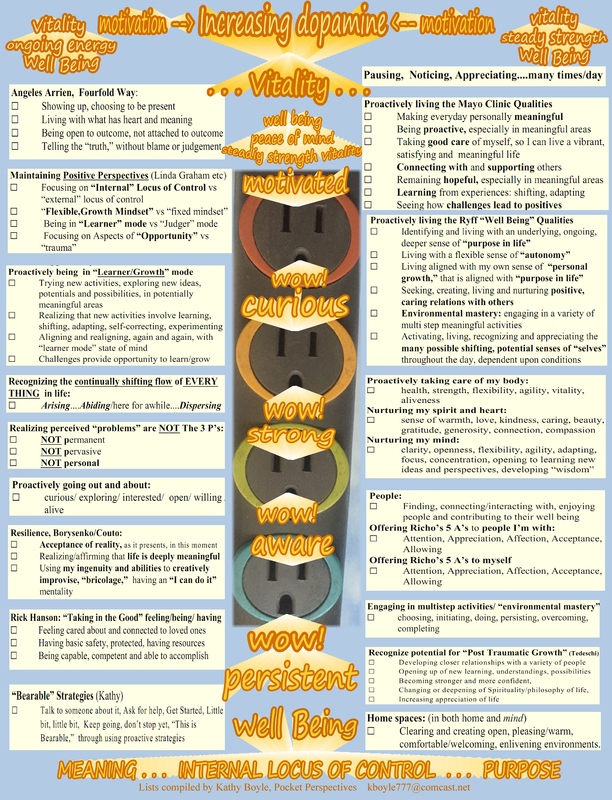 that influences the house that I’m building…..
the ideas on the “Charging Well Being” checklist! I thoroughly enjoy creating these pages…I LOVE creating them… I thoroughly enjoy thinking, reflecting, observing, analyzing and pulling ideas together, choosing colorful backgrounds and fonts, photos etc… it may not be apparent to others, but every font, color, line, image has some deeper meaning or symbolism that supports what I’m trying to reflect upon, understand, learn, take in or practice. 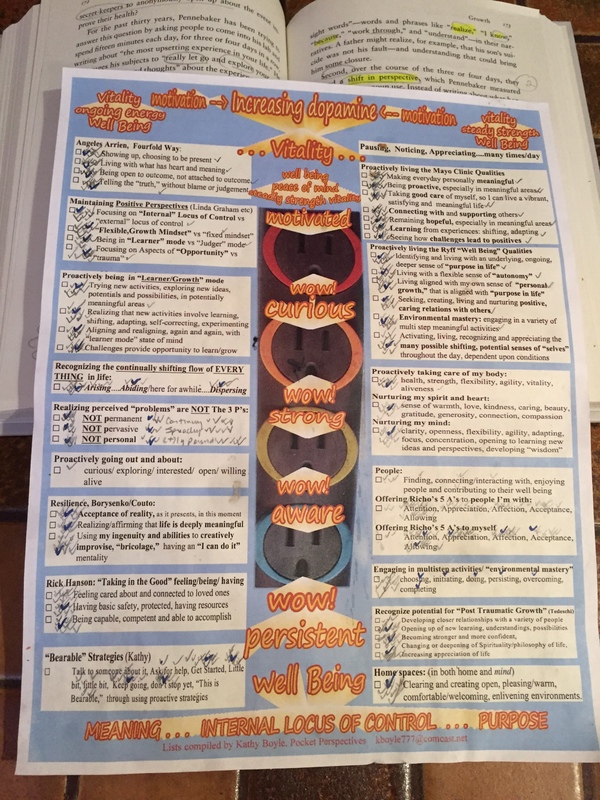 The main purpose, however, for these colorful, engaging “pages”..the checklist included… is practical: I print them out, tape them up around our house, look at them, reflect on them, remind myself to “live” the ideas…. 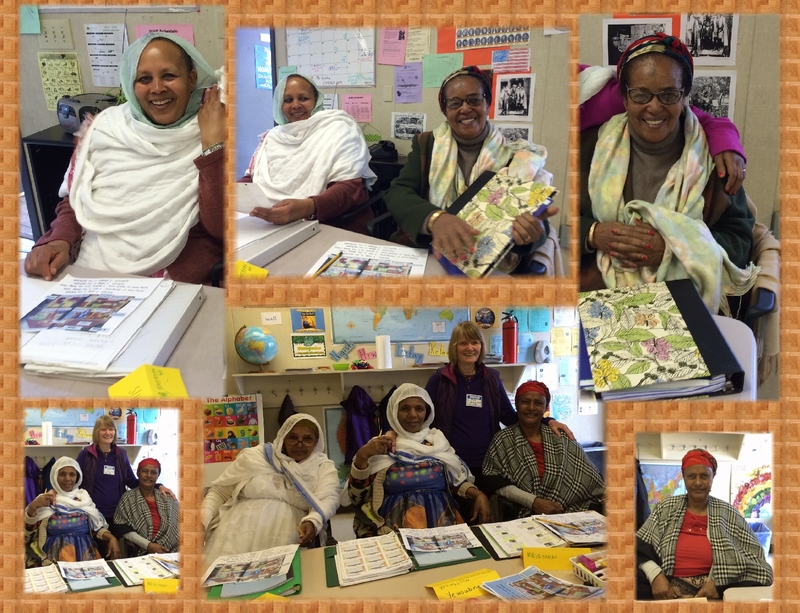 using effective teaching and learning principles that I learned and used throughout 40 years of teaching school…for the purpose of developing more positive ways of living my life in an increasingly rich and more deeply meaningful manner. 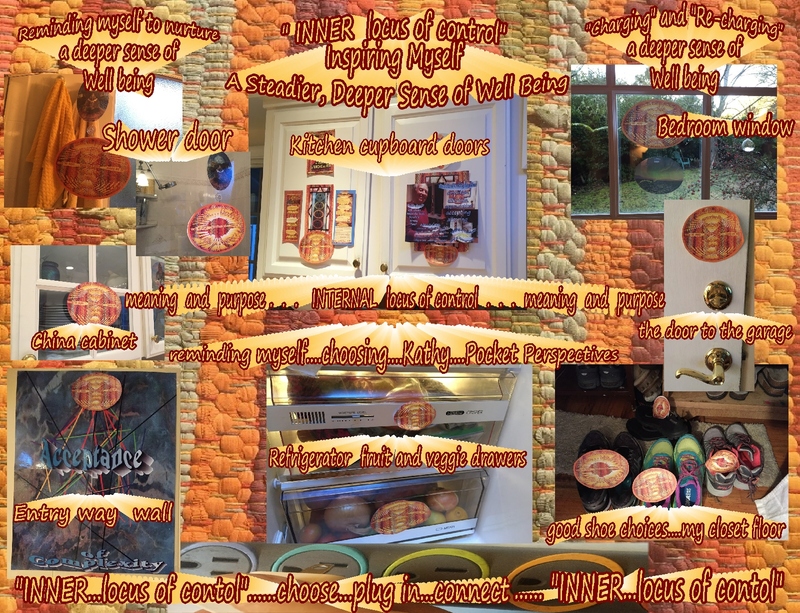 Photos of the “image” pages taped up around our home…. still a “teacher”…. teaching myself…. 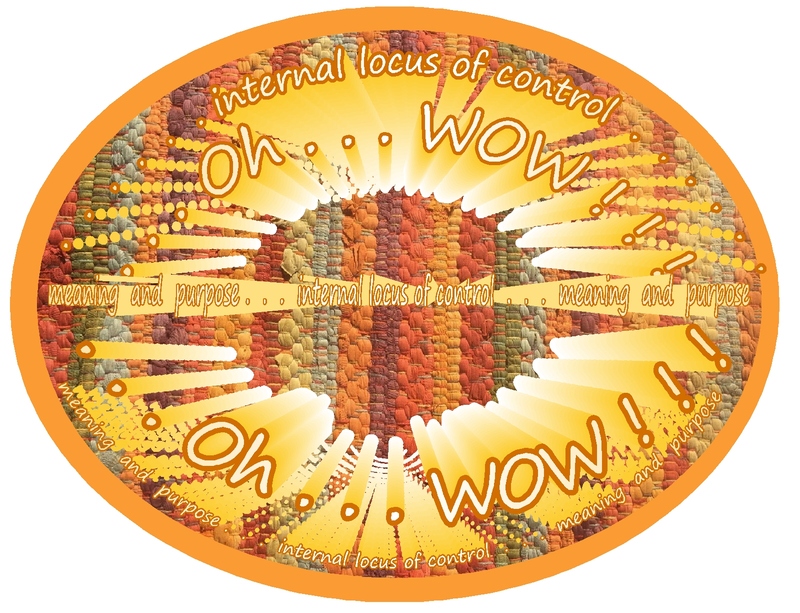 encouraging my increasing awareness of this “reality” of “inner locus of control”…and reminding myself..again and again and again… to shift back…into that precious “wisdom” awareness of “inner locus of control”… perhaps, like the Bodhisattva vow…. 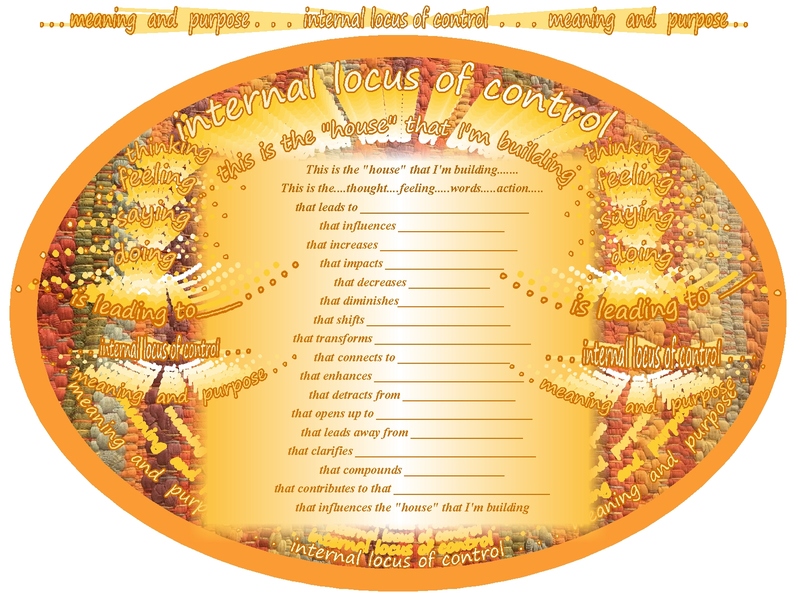 taking responsibility for using “inner locus of control” to choose intentions, thoughts words and actions that can bring benefit to myself and those around me…. Note: I was an Elementary School Resource Specialist and Special Ed teacher for 40 years. 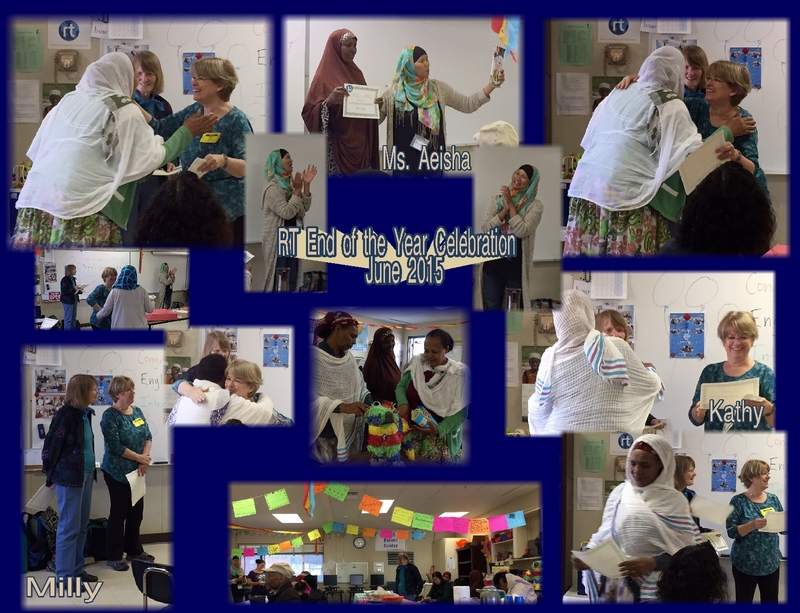 I’m retired from teaching now, and am still trying to connect or reconnect with…or find new places or ways to engage with… that deep sense of meaning, purpose, contribution, inspiration and belonging that I had while I was teaching. 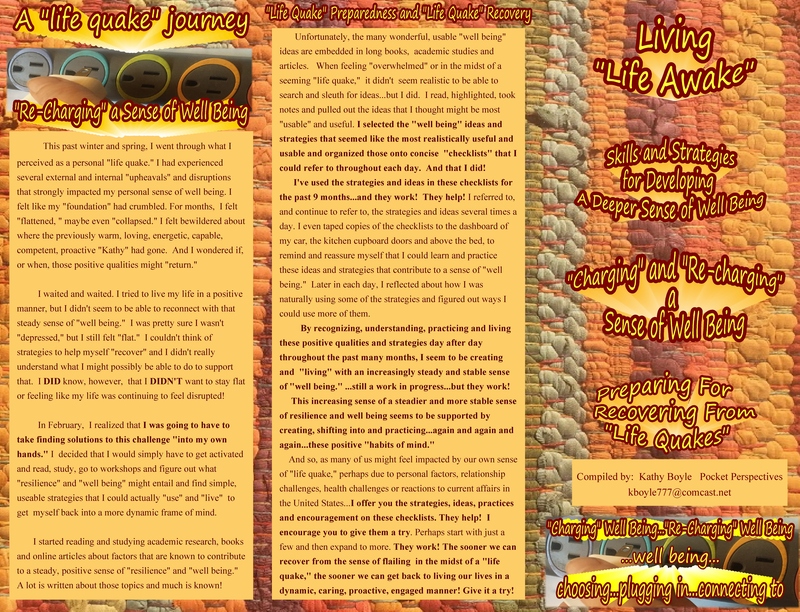 The “pages” I create might look like they’re more suited for “kids”…but lots of the challenges we face in life seem to come out of that “young, vulnerable, confused or hurting” aspects of ourselves…so the “youthfulness” of these colorful pages might “speak” to that young part of ourselves. And those “youthful,” child-like parts of ourselves often seem to value novelty, color, symbols and few words… learning and shifting by getting right to the essence of ideas, awareness, understanding and strategies through colors and few words! 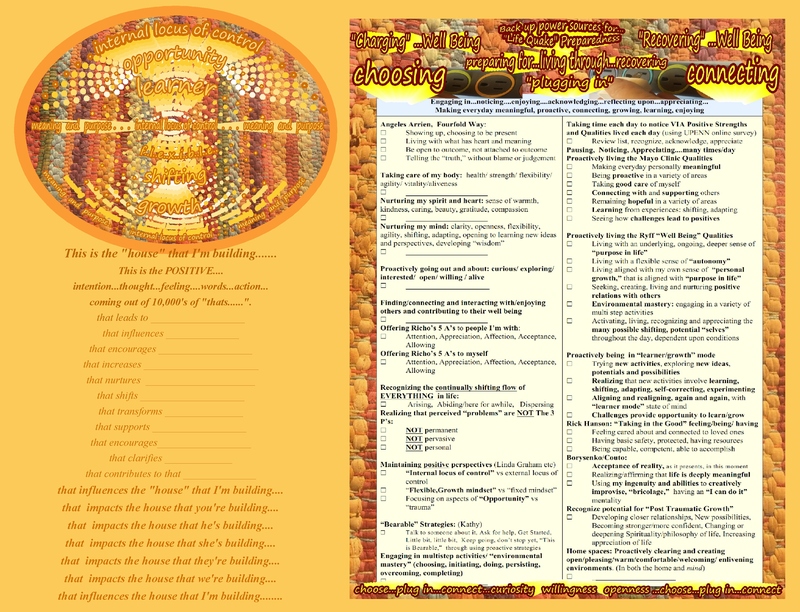 Ever since I started creating these colorful image “pages”, I’ve sometimes been sharing some of the “pages” on my blog, Pocket Perspectives, when I’ve actually used the pages for a few days, weeks or months and found them helpful in leading to understanding and shifting and think the pages might be helpful for others….then I share them in Pocket Perspectives…. 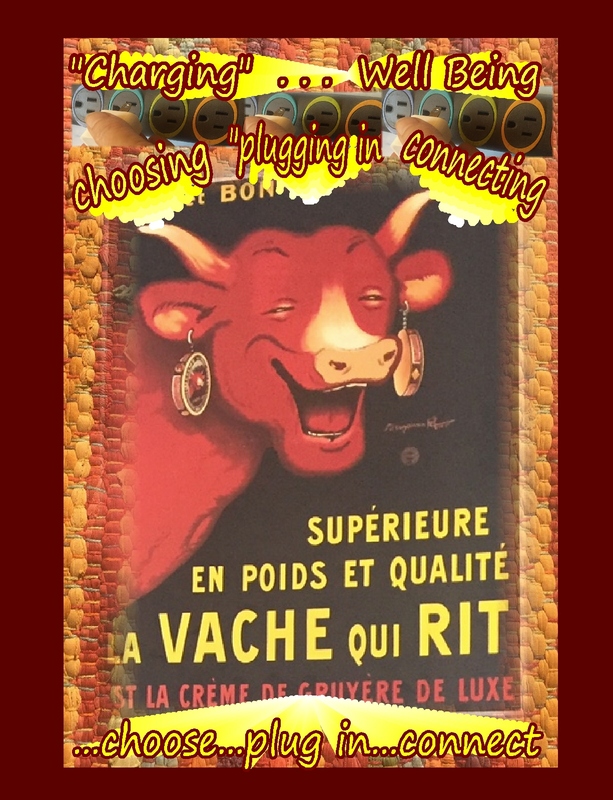 I also create and share what I hope might be helpful “pages” in my other blogs: Reflections for a Friend, encouraging, insightful and warmhearted ideas from my husband’s and my friend Ven. 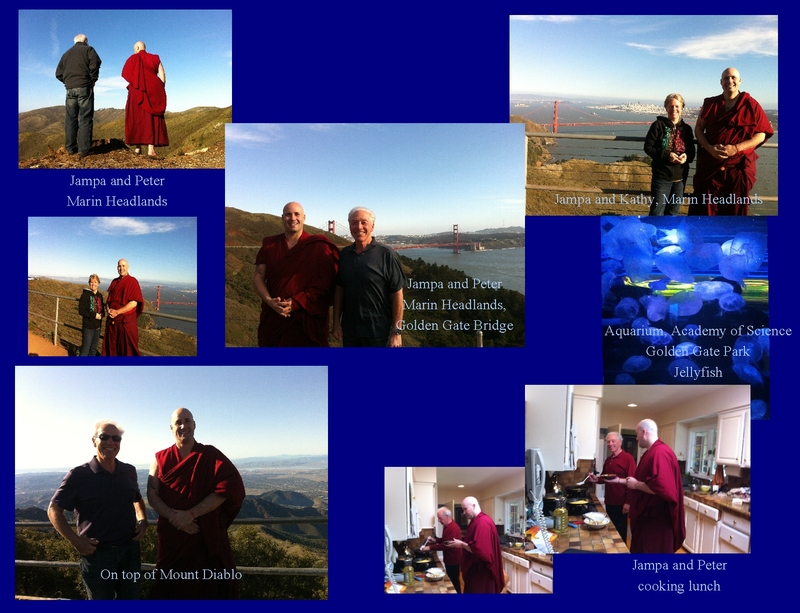 Jampa and others…. I learned sooooooooooooooooooo much from them! 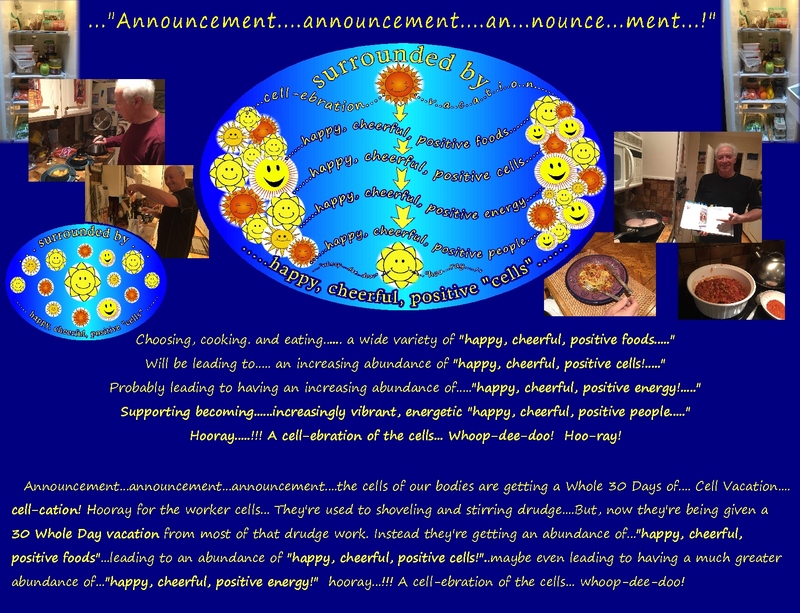 As I was setting my intentions….identifying and affirming positive intentions and potential possibilities that might be coming out of making healthier food choices….I also used several playful approaches for setting intentions and seeing potential benefits…and sharing playful perspectives with my husband and daughter! Creating playful pages and sharing my positive Whole30 intentions with my husband and daughter …all intentions for doing Whole30 are aligned with the “Charging Well Being Checklist”.… … trying to help all 3 of us lighten up about the seemingly ambitious (!!!) 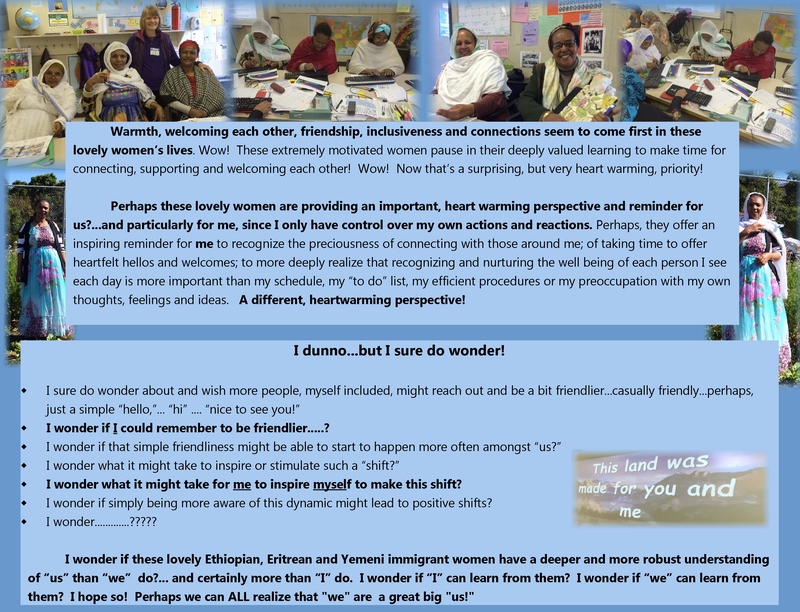 plan we were about to be engaging in and seeing possibilities…. I made this page, below, with photos of what I’d completed during that “clearing out” closets, drawers and shelves” process, to remind myself about and affirm how good it feels to have positive, proactive energy that benefits both my husband and me, as we’re cooking together, side by side, in a more organized and spacious kitchen! Surprisingly enough, I’ve also had the VERY UNEXPECTED energy, interest in and motivation to walk the Lafayette Reservoir loop (3 miles) FIVE days in a row! For the past many months, I haven’t been able to walk more than 5 minutes without pain in my feet, so I wasn’t walking or getting out much anymore. 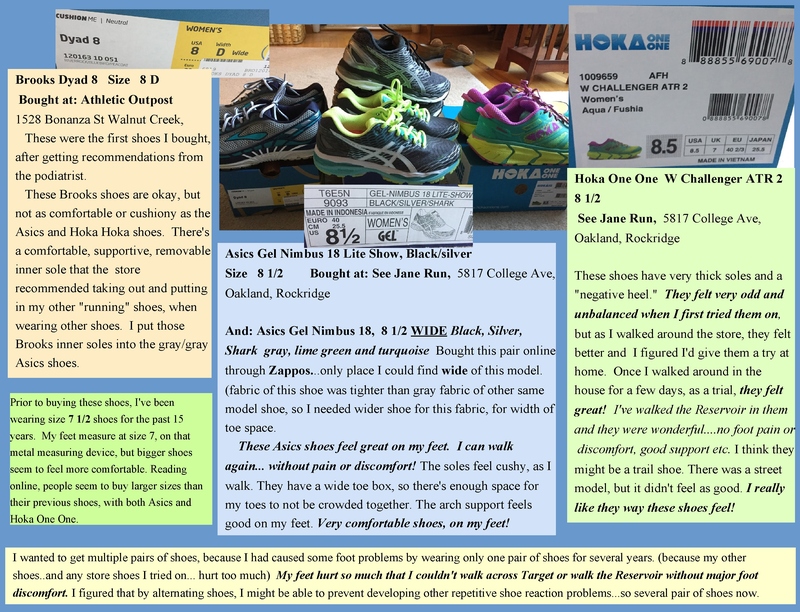 I finally went to a podiatrist, found out there was actually a correctable problem, and so I researched, shopped and found several pairs of comfortable shoes….Wow! Amazing…almost like a miracle… to be able to walk again! Uh oh! My husband and I are cooking together, side by side… for 30 WHOLE DAYS!!!….and…. it hasn’t been easy! I had been discouraged and given up on cooking for the past year, but due to Whole30, I’m back trying to get myself going again, eating more healthily and sharing the prep and cooking with my husband. 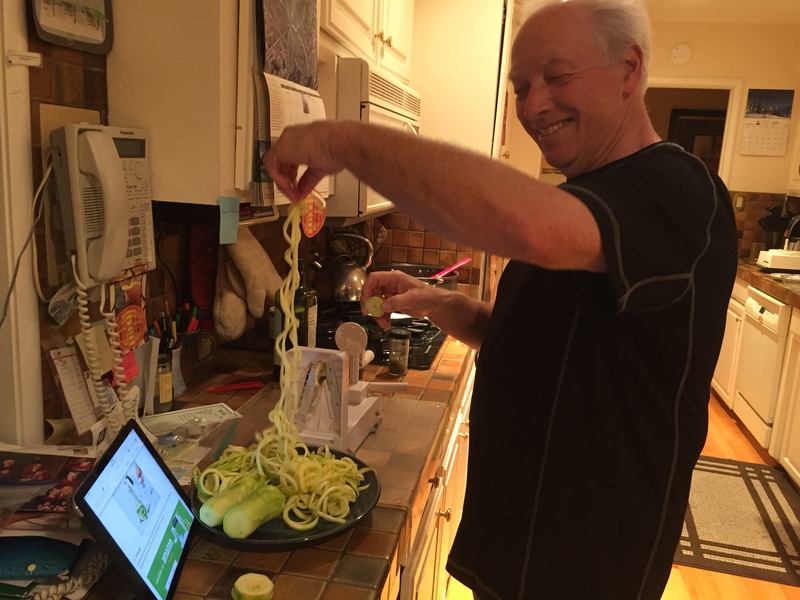 January 2…our first day!… my husband “spiralizing” zucchini …learning new ways! So…. 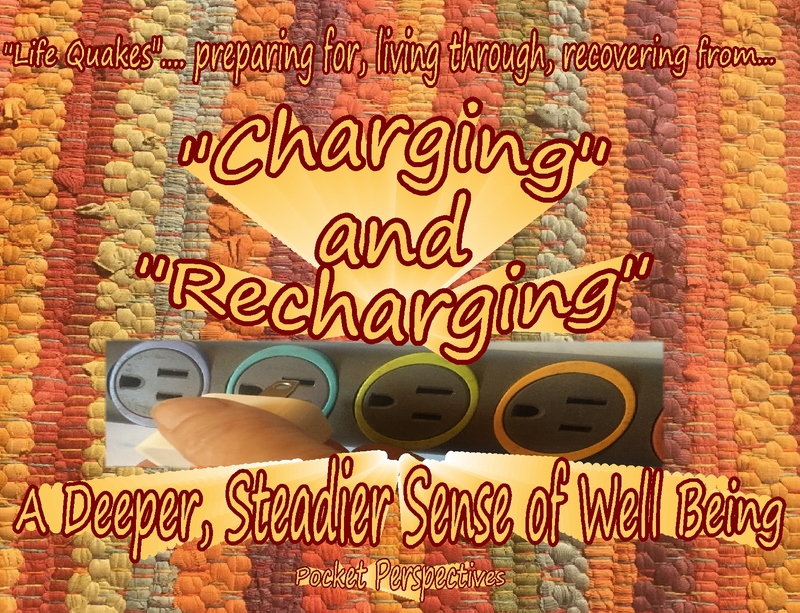 cooking together, side by side: definitely a practical, slightly high stress, everyday situation for actually using the “Charging Well Being” checklist ideas. 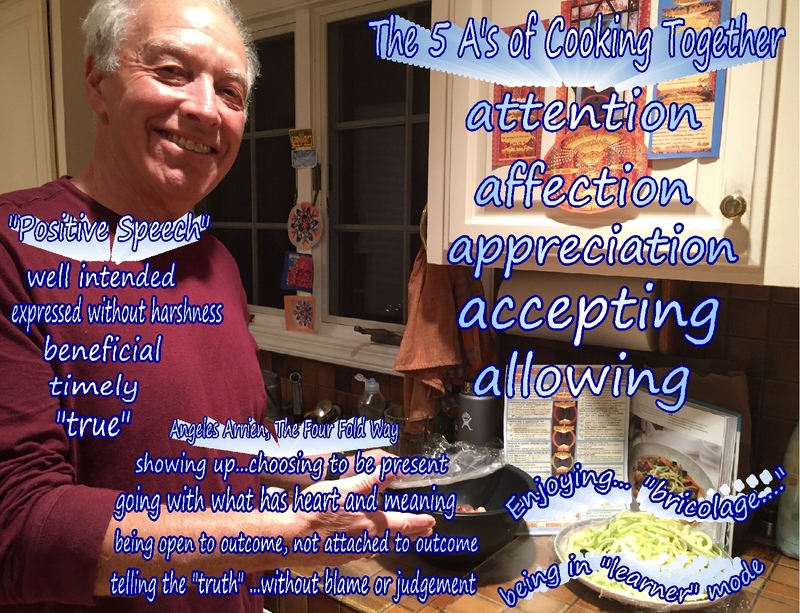 I created this photo page to remind, motivate and inspire myself of my commitment to trying to live with and use positive qualities… using several of the more pertinent ideas from the “well being” checklist….using a background photo of my husband Peter cooking happily…. 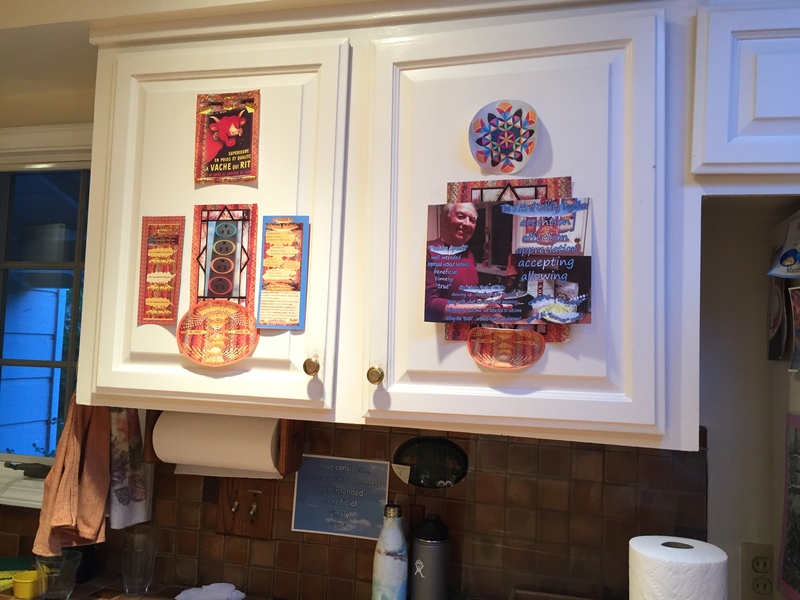 and then printed it out and taped this photo page up onto the kitchen cupboard door….right in front of the chopping/prep area! “The 5 A’s of Cooking Together” …. engaging with the cheerfulness of…. inner locus of control, in accessing these positive qualities….right???? Reminding myself….again and again and again…. 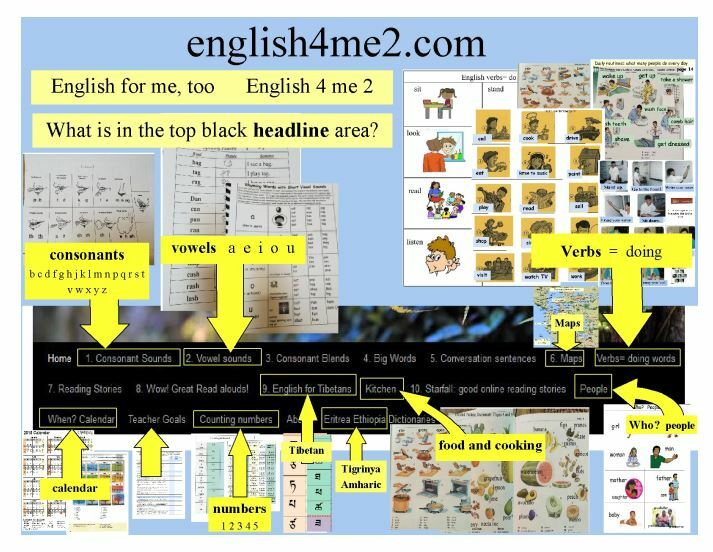 Shifting back into learner mode…. 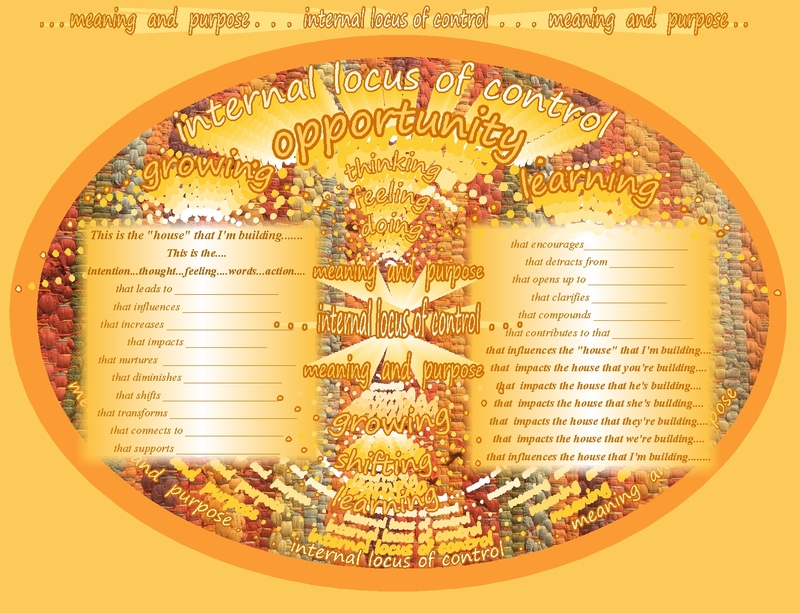 … making an intentional commitment to living with….